Budapest is known for its many gorgeous and unique landmarks that are scattered among the city from one block to another. Buda and Pest, once two different cities on opposite sides of the Danube, have two very different lifestyles and cultures. Buda’s skyline is dominated by castles, cathedrals and residential villas, while Pest bustles with the daily life of an urban and government center. And as such, many different monuments stand out, some of which attract tourists in large numbers seeking a photo opportunity as a souvenir of their trip… And while images of many of these monuments litter keychains, pins, mugs, and other items at tourist stores around Budapest, others are much more hidden, or have many layers to their, their location and their place in national memory. A square near the Hungarian parliament building offers an attractive photo opportunity for an avid tourist; it also captures an interesting aspect of Hungarian history. 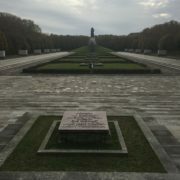 The Soviet War Memorial serves to commemorate the Soviet liberators who freed the people of Hungary from the Nazi occupation during the Second World War. 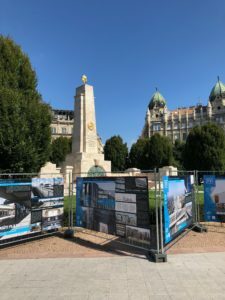 While this monument is well taken care of and used as a means to show gratitude to another regime that would soon, in the post-World War Two era, dominate Hungarian life, it hides the fact that until 1944, Hungary was an ally of Nazi Germany. During the early 1930’s, Hungary conducted trade with both Fascist Italy and Nazi Germany. At the time, Hungary faced the rise of large-scale nationalist movements and political parties. Much like other Axis allies during the Second World War, Hungary was a puppet state to Nazi Germany under Third Reich’s orders. In fact, in 1940, Hungary became an official ally to Nazi Germany and contributed to the Reich’s war efforts by sending Hungarian troops to aid in the invasions of the Soviet Union and Yugoslavia. However, by 1944, at a time when Hungary was working towards an armistice with Allied forces, the country was officially occupied by German forces, which lasted to the end of the war. Up until this point, the Jews of Hungary had been kept relatively safe. But under Nazi occupation starting in 1944, Hungary sent its Jews off to concentration and death camps where most of them died. Within a six week period, all of the Jewish residents of Hungary in 1944 had been deported and sent to their deaths. 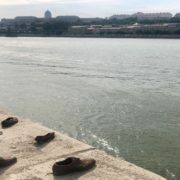 It is from this period of occupation during which half of Hungary’s Jewish population was murdered, that Hungarians today draw evidence to promote the idea of Hungarian victimhood. For Hungarians, who had participated directly in the destruction of the country’s Jewish community, their liberation by the Soviets allows them to dismiss this incriminating past, by placing them on the side of the victims rather than the perpetrators. 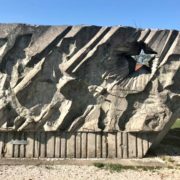 The monument of gratitude to Soviet liberators plays into this notion of Hungary as a victim, de facto covering up this past. leaving the history of the destruction of Hungary’s Jewish community out. 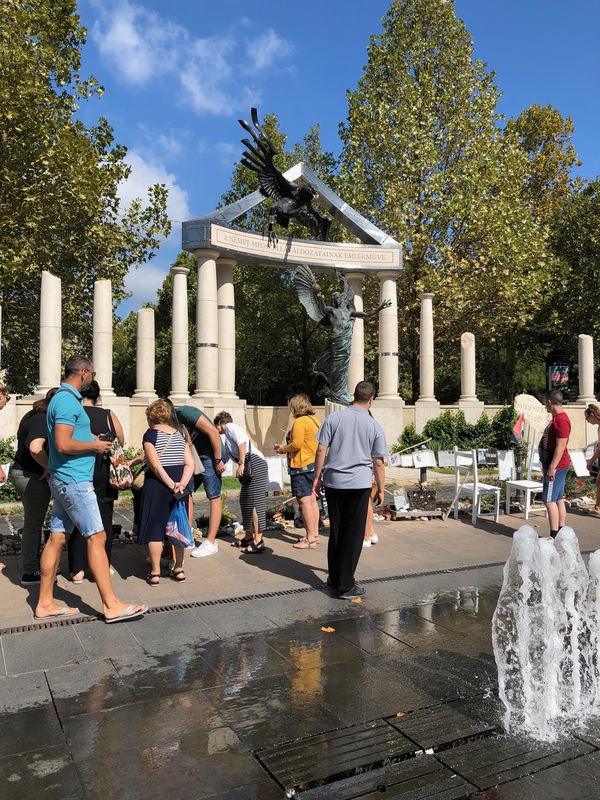 In the monument, Hungary is portrayed as a shackled angel (now turned light green thanks to the passage of time, allowing a passerby to see how long this monument, as well as its message, have been standing) being held captive by the black eagle symbolizing the Nazi regime. Hungarian citizens, including Jewish relatives of the victims and survivors, however, are showing their opposition to this portrayal of history by the government. An alternative counter-memorial has appeared in which various pictures, letters, and self-placed objects have been placed at the site. These images and drawings, scattered and hung among fallen petals and dying bouquets underneath the monument, are what captures the attention of passersby. The official monument seems to almost be out of taste when compared to the human element of the counter-memorial. The photos and objects of the counter-memorial are here to send a single message: we lived and we don’t want to be forgotten. Sadly though, with this push for the unified and accepted idea of Hungarian victimhood among citizens, it’s not known if the story of Jewish victims reaches society at large. While there are memorials for just Jewish victims, in particular, the Holocaust memorial center, it does not figure visibly as a public place of commemoration. 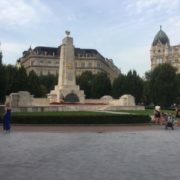 Both of these monuments portraying Hungarian victimhood are highly visible, unlike the Jewish monuments. 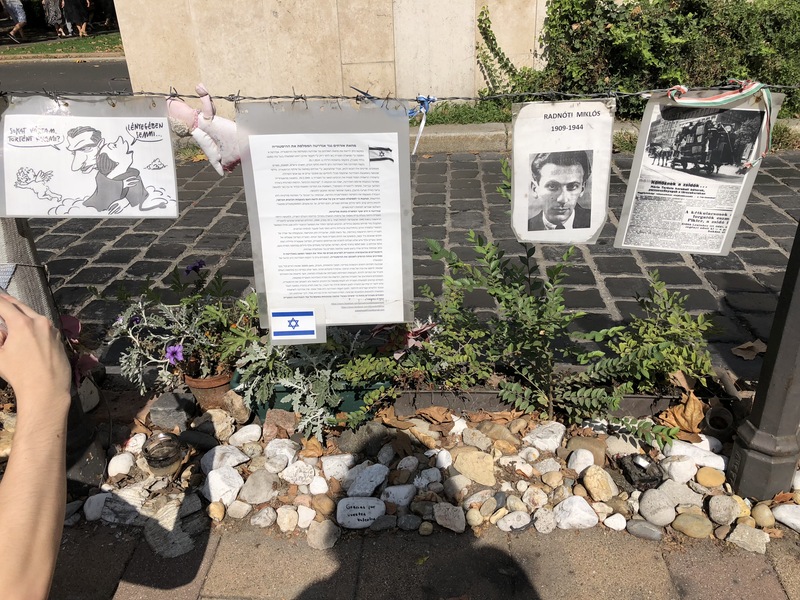 The Holocaust Memorial Center, which tells the narrative of the Hungarian Jewish experience during the years before and during the Second World War, is hidden behind a wall in the middle of a street away from the city. 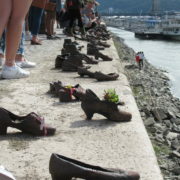 Another memorial, Shoes on the Danube Bank, pays respects to Jewish victims who were lined up and shot into the river by the members of the Hungarian Arrow Cross, is overshadowed by the views of Buda and its castles. 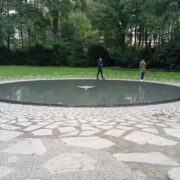 Not to mention the behavior of some tourists who stand around the memorial where many Jewish victims breathed their last breaths, taking a selfie, unaware of the tragic history tied to this place. 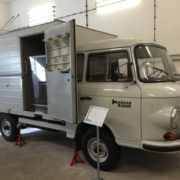 Hungary has attempted to cover up the history of the country’s crimes and involvement in the Holocaust during the Second World War. Its victimhood narrative denies respect and decency of the victims. 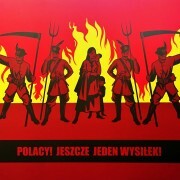 Such rewriting of history in order to make a country and its people look better while overshadowing the tragedy of true victims should never occur. Changing the history of victimhood and loss is disrespectful to the memory of those who lost their lives. 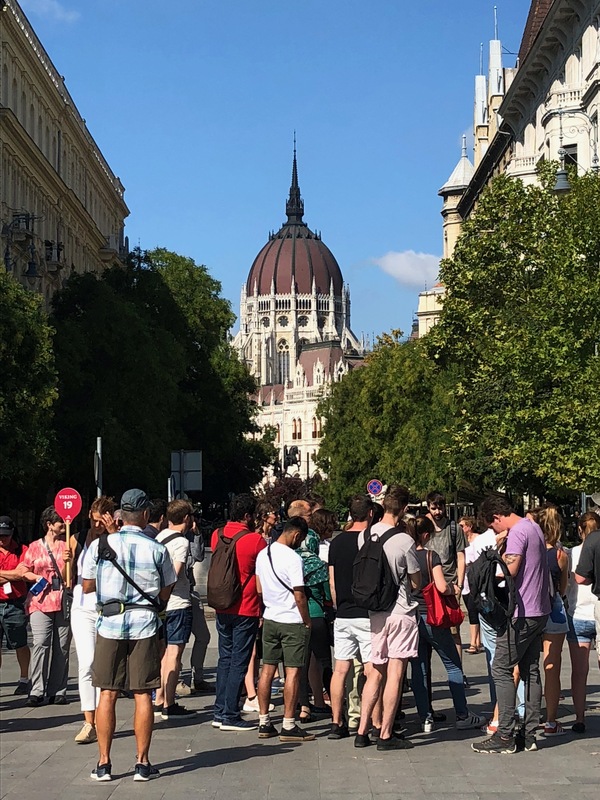 When one finds oneself in Budapest, it is important to look behind the obvious when it comes to sites and monuments of memory.